Construction workers prepare the road between the Activity Center, South Engineering and Computer Science building and Student Services Building Addition for an updated road surface. The project should be complete by Nov. 30. Photo by William Legrone | Mercury Staff. 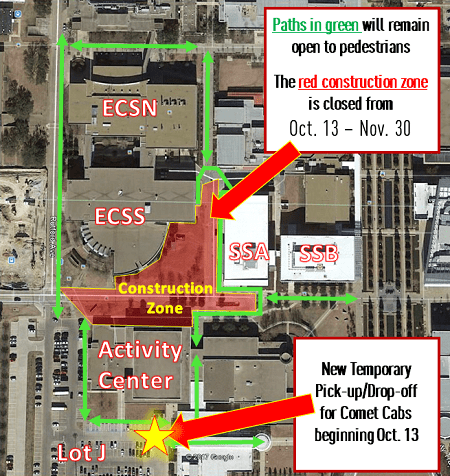 Recent construction near the center of campus has closed walkways and moved the Comet Cab pickup location. Renovation for Drive C began on Oct. 13 and led to closure of public walkways between the Student Services Building Addition, South Engineering and Computer Science building and the Activity Center. These blocked-off areas force students to rethink their paths to activities and their reliance on the Comet Cab system. With the new Comet Cab route, students such as neuroscience sophomore Nicki Neely said she had concerns over the current construction. Photo courtesy of UT Dallas. ATEC Senior Addison Dobias said he was confused about the construction. “I think if things were more explained as to why things were blocked off or why the construction was happening, students could feel more at home or happy with the construction,” Dobias said. According to the “Pardon our Progress” page on UTD’s website, the construction should finish around November 30.